Catherine O’Flynn is one of four debut novelists on the Booker Prize longlist, and What Was Lost was previously longlisted for the Orange Prize. It’s been widely enjoyed by other book bloggers, and it promised to be an accessible change after the superb exoticism of Indra Sinha’s Animal’s People. O’Flynn’s story is one of loss and consumerism: in 1984, ten year old Kate Meaney spends a lot of time in recently opened Green Oaks shopping centre, imagining life as a ‘girl detective’ alongside her sidekick, craft-kit cuddly monkey Mickey (“Kate ate the burger and perused the first Beano of the new year, while Mickey kept a steady eye on some suspicious teenagers below”). She goes missing, and we rejoin the story in 2003 when Kurt, a security guard at Green Oaks, and Lisa, a music store manager in the centre, discover a mutual interest in Kate’s disappearance. What Was Lost made me laugh on page one – no mean feat from a standing start – but it’s often the case that the things which first attract you ultimately repel you. Although the first half of the book is frequently funny, too often the humour takes the form of comic observations which seem better fitted to a stand-up show than a work of fiction, and it doesn’t help that most of the main characters share the same wry take on the world. One minor player, Lisa’s colleague Dan, seems to exist as a mouthpiece for the sort of prolonged humorous rant which traditionally ends with the studio audience bursting into applause. Of course Ben Elton is a devil for this sort of thing too, but O’Flynn seems to have more serious aims for her book. And there is seriousness here which is often well done. O’Flynn captures neatly the joylessness of any place constructed to force pleasure down people’s throats, and her portrayals of parents and children in dysfunction and death are effective. The book is also highly readable, and I found myself racing through it (and not just because of the time pressures of reading the entire Booker longlist…). But there are less satisfying aspects too. To make the plot come together, O’Flynn needs to create an exaggeratedly unrealistic character (who I won’t name to avoid spoilers), whose status as comic relief sits uneasily with their serious role at the end. I also found myself annoyed by smaller things, like the bizarre decision for every single character, and the narrative voice, in this Birmingham-based novel by an English writer to refer to their mother as “Mom.” (Edit: but see the comment by Ben below.) Every time it happened, I wondered where the American person had appeared from. For what I thought was a subtler and richer discussion of lost children, I’d recommend Jill Dawson’s Watch Me Disappear (which didn’t get a sniff of the Booker lists!). My god John, you are racing through these books! Are you reading a book a day?! Do you have a proper schedule? And are you reading the books in any particular order? Have to say your review of this one hasn’t sold it to me… It was the Americanism (‘mom’) which turned me off most. Ah yes, ‘mom’. Just a small thing, but a BIG annoyance. Ah thank you Ben, I had no idea about that. I’ve edited the review to put a note in. It does sit very oddly indeed though for other British readers. Kimbofo, yes I am getting through them faster than I thought I would! But that must be a good sign, showing they’re all very readable. Of course I have a few 450-pagers to go (Tan Twan Eng’s The Gift of Rain, which I’m now reading, and Michael Redhill’s Consolation) plus the mammoth 840-page Darkmans by Nicola Barker … so I need to earn myself a few days in hand! Oh dear. I thought this sounded good from the synopsis but your review has thrown a cloud over that. I dont really do humour so that aspect wont lift it for me! I’ve got the Jill Dawson on a To Get list, so I’ll move it up on your recommendation. I’m on Consolation at the moment, and I dont think it is as long as it looks, its deceptive because of its strange sizing I think. And quite an easy read too! Excellent, of the four I have left to read, Consolation is the one I’m looking forward to (along with Anne Enright’s The Gathering). I picked it up in Waterstone’s and know what you mean: small pages and quite a lot of dialogue so far as I could see! It would be a pity if this process put anyone OFF reading a book – surely the shortened longlist and the reading frenzy that it has precipitated is supposed to encourage people to read the books. Of course, thirteen is still a lot, so it makes sense to take on board the comments of a reviewer whose opinions tend to match your own. I think John might have actually overemphasised the comic elements of the book over the underlying stories of loss. I think he’s trying to say that the comic passages undermined it for him, which is fair enough, but the overwhelming emotion in the book, for me, was one of sadness, not Ben (urk!) Eltonesque set pieces. The way that the character of Kate is built up, so that we get to know her, before she is whipped away, and we are left to discover the impact on those whose lives she touched, is extremely well done. I do find many of the passages very funny, but mainly I find the book very sad, in a good way. Yes Ben, I did think the comic stuff (which as I say, I thought very good to begin with) threw it a bit off kilter. I didn’t dislike the book and don’t resent the time I spent with it at all, but I only read it because it’s on the Booker longlist and it’s for me the weakest of the nine I’ve read so far. I was interested to read in an interview that O’Flynn rates Gordon Burn among her favourite writers. He is excellent on many of the issues What Was Lost touches upon – the impersonality of modern society, our relationship to our surroundings, popular culture, loss – and his recent book Best and Edwards (just out in paperback) was my favourite book of last year. Good point Ben about these reviews not putting people off. No chance of that. I read these reviews like any reviews, just to take in someones personal perspective on the book. But I figure we are all individuals and what one likes another might like less and vice versa. I will read all the longlisted books (although not necessarily within my time scale), and wont be put off whatever the review – in fact sometimes I seek out books with bad reviews just to see if I disagree. When I get to this one I will be interested to see how I respond to it. All of which isnt to say that John gave this a bad review, just that I didnt like the sound of the book that much. 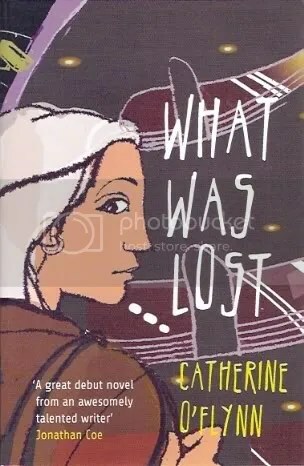 Just to let you know that Catherine O’Flynn will be at ‘The Stratford-upon-Avon International Festival of Literature’ on Friday 18th April, 2008, at 7.30pm. I found this book very touching, at first I picked it up because I share a surname with the author (I am no relation to her, except perhaps distantly) I found the comic parts of the book endearing rather than off putting and i felt that this use of humour was interesting when discussing such a difficult subject as child disapearances. The book had me enthralled so much that I was unable to sleep until I had finished it. The characters were carefully constructed to allow the shock ending to work. I think it is definatly worth reading even if an element annoys you because it was written well and it flows easily. Hi Anna, I’m glad you liked the book. I didn’t think it was a bad book as such, just that by the time I read it, it had been highly praised and I didn’t think it stood up to that. Of course it’s been listed for several awards and won one of them, so that just goes to show – something! Interesting review, I enjoyed the book (more than John did in fact), and found the blend of comedy and sadness quite refreshing. I also thought it captured beautifully a lonely childhood and separately the banality of working in a service environment (I believe Catherine O’Flynn used to work at HMV, which I’m sure has no resemblance to the music store one of the characters works for at all, no, not even slightly). Mom jarred with me too, I actually wish there’d been a note or something explaining it was common usage, because outside Birmingham it’s seen as an Americanism and did strike me as very odd every time it arose. I’ll take a look at the Dawson, part of what worked for me here though was it wasn’t just a novel about a missing child, it’s also about other kinds of loss and also the banality of tragedy and a kind of everday despair thrown into relief by actual horror. Or I may be overthinking it in hindsight, who knows? I’ll be interested to see her next novel anyway, and I think Tindal Street Press is to be praised for bringing it to our attention. I have to say that I completely disagree with your idea of the humour being similar to stand up in the first half, we mustn’t forget here that this section of the novel is being narrated in a childlike fashion as Kate is a child. Although this may seem humourous to an adult, as often things children say are, it is absolutely necessary for the development of the novel. It makes the second half all the more heart breaking as we see how her innocence, which was captured through that style of writing, is destroyed. Dan’s rant, as it is full of swearwords, I think is designed to make the reader feel shocked and also sad for the small mindedness of some people. It is, obviously, exaggerated to a certain extent and there is an element of cheap humour within it, but overall it shows the reader how much of a negative place Green Oaks is as someone with that limited intelligence can progress so far up the business ladder. Of course this is just my own opinion and I may very well be wrong!